Armani has a new product that is permanent to its cosmetic line! It is a cream-like, powdery shadow. It is very pigmented and can be used wet, dry and doesn’t need a base (really?). It comes in a glass pot similar to Mac’s paint pots. Check them out. This innovative hybrid texture, which is not a powder, nor a cream acts like a smooth, lasting color film. Each shade is intensified with a second pigment for a multi-dimensional effect. In just one swoop, create a wet, shimmering smokey eye. 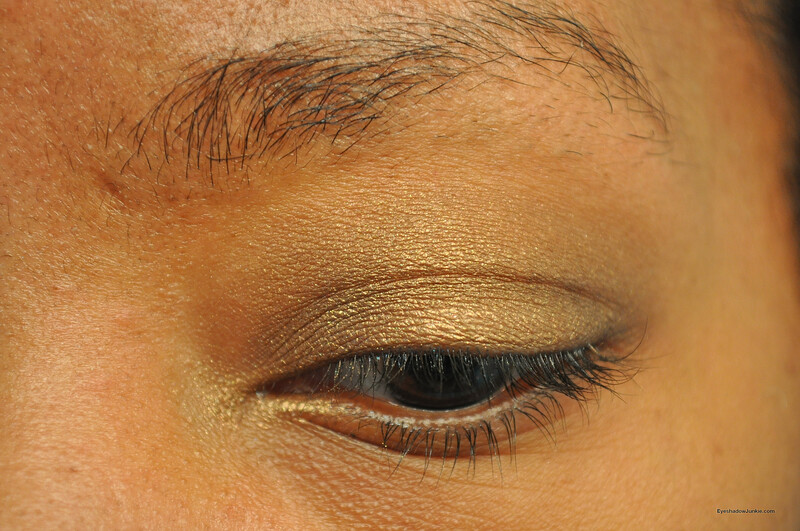 Base color covers eyelid, and second pigment adds drama to the contour. The technology: Color-FilTM, for the first time in an eyeshadow. A new high resistance bi-polymer enables the formula to perfectly fit the color to the eyelid with cushiony suppleness, for a never seen comfortable long wear. Twenty four hour color wear, crease proof, flake proof, waterproof and sweat-proof, Eyes To Kill Intense Eyeshadows slide on, stay on, but wipe off in an instant. Apply wet or dry with fingers or the Armani large eye contour brush. These bad boys sure ain’t cheap. $32!!! You get a lot of product for your money (4 grams) though. Armani offers 13 colors in total. Along with the four I purchased, there is a black on black, copper, gold and varying shades of champagne and silver. Unfortunately, the shade name doesn’t appear on the product label, just the number. This is the first product I’ve purchased that I would consider high-end. I don’t own lint from anything Armani let alone an entire item. So this was definitely a splurge for me. I’ve spent more on a makeup haul of course, but I would get much more for my money. The consistency is hard to explain. It is smooth, but not creamy when initially touched. Once the product is on your finger, it feels powdery. It doesn’t go on patchy and is very easy to blend. I used my fingers for the swatches. Those with long nails will find this product difficult to use. Luckily the nail on my index finger broke off a couple weeks ago otherwise, I would’ve struggled. I didn’t have much luck using a shader brush. I couldn’t get the shadow to adhere to the bristles. It was a little better with a damp short shader brush because the bristles are stiffer. I wouldn’t make it a habit to dip a damp brush into this product because the moisture may make it go bad quick. These suckers are too expensive! The arm swatches I did are over several bases including Urban Decay Primer Potion, NARS Smudge Proof Eye Shadow Base, dry and wet. I didn’t have issues with either type. Dry seems to be the best method for an overall wash of color. I got the most ‘intense’ results using this product on a wet surface. I’ve been intrigued by cream shadows, but never purchased them because I knew it would crease (despite a good base) and would be a waste of money. This product has promise. I was very skeptical with Armani’s sweat proof claim. I mean come on! Sweat proof? I decided to do a little ‘road test’ with these shadows. I applied the No 6 shade (dry, no base) and went on a 7-mile run outside in 70 degree weather. (I was going to do this run anyway. I am not that dedicated to makeup testing.) Included in the slideshow are pictures taken before and after my run. Believe me, I sweated plenty and these shadows are definitely not sweat proof. Perhaps it would’ve performed better with a base. The shade didn’t completely disappear, but there are patches of skin showing and creasing. I’m sure Armani didn’t test its product out on someone running for an hour. I suspect these shadows would hold up well for a long night out. I’m certainly looking forward to using these shades for a quick, easy look for hot summer days and during vacations.